A bizarre asteroid that sometimes behaves like a comet, is even more enigmatic than previously thought, according to new research. Using telescopes in Hawaii and Arizona, the team studied sunlight reflected off the asteroid, dubbed Phaethon, which is known to be blue in color. 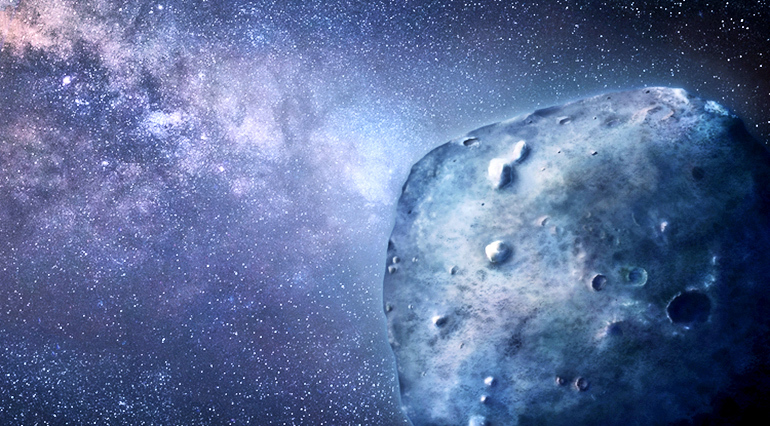 Blue asteroids, which reflect more light in the blue part of the spectrum, make up only a fraction of all known asteroids. A majority of asteroids are dull grey to red, depending on the type of material on their surface. While blue asteroids are rare, blue comets are almost unheard of. Phaethon has intrigued astronomers for other reasons, too. It has the qualities of both an asteroid and a comet based on its appearance and behavior. Until scientists discovered Phaeton in 1983, they linked all known meteor showers to active comets and not asteroids. Phaethon also releases a tiny dust tail when it gets closest to the sun in a process that is thought to be similar to a dry riverbed cracking in the afternoon heat. This kind of activity has only been seen on two objects in the entire solar system—Phaeton and one other, similar object that appears to blur the line traditionally thought to set comets and asteroids apart. Researchers obtained several new insights about Phaethon after analyzing data from NASA’s Infrared Telescope Facility on Mauna Kea in Hawaii and the Tillinghast telescope, which the Smithsonian Astrophysical Observatory on Mount Hopkins in Arizona operates. They think Phaethon might be related to or have broken off from (2) Pallas, a large blue asteroid farther out in the solar system. Kareta presented the results at the 50th annual meeting of the American Astronomical Society’s Division for Planetary Science in Knoxville, Tennessee.